View Accelerate25’s video on growing a prosperous Manawatu-Whanganui by 2025 below. Our region is strategically located at the geographic centre of New Zealand. 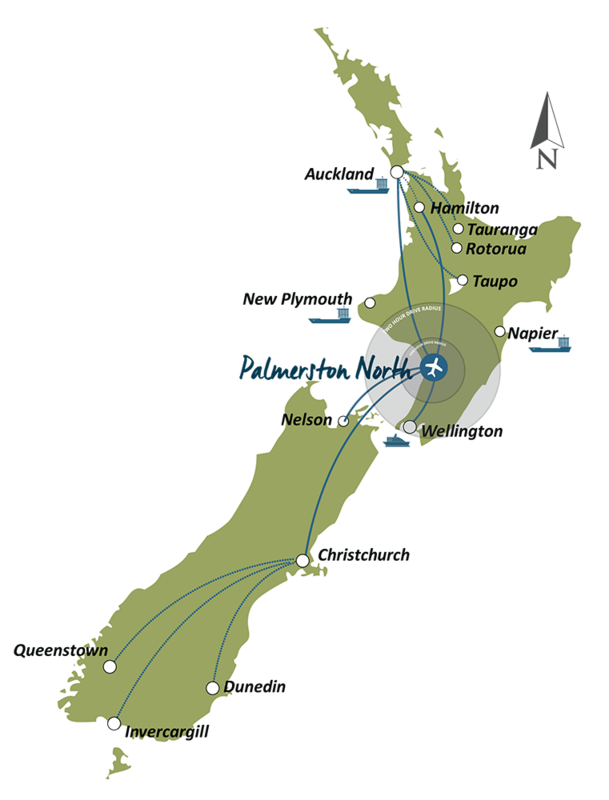 Its largest city, Palmerston North, acts as a central hub for the North Island with highway, rail and air connections to major centres and regions in all directions, creating a successful distribution and logistics centre. The agricultural sector underpins the region’s economy. It’s an important producer for the New Zealand meat and dairy industries. The growth and productivity of these industries is supported by a strong agricultural research base in the region and innovative agritech manufacturing firms. Reliable rainfall, good sunshine hours and quality soils create a strong base for agricultural production, making it possible to generate high-quality, sustainable protein for overseas customers. Our region is a national centre of excellence for food innovation and agribusiness research. The food and agricultural industries partner with research centres to create investment opportunities in production, processing, manufacturing and biopharmaceutical product development. The high concentration of world-class research and business collaboration offers a compelling case for more international companies to locate their agrifood-based operations in the region. We have positioned ourselves as a compelling location for contact centres and business support functions. Our location keeps us close to the pulse of government agencies and corporates in Wellington, along with excellent links to New Zealand’s other main centres and high-speed digital connections to international markets. Contact centres and business support operations in the region also benefit from an attractive cost structure and a relaxed regional lifestyle for local and relocated staff. If you are thinking about investing in our region and would like to chat about the opportunities here, contact us today.